Kingswood is a well-maintained, family-friendly neighborhood consisting of 221 custom-built homes located in Carmel, Indiana. The neighborhood is located in southeast Carmel, bordering on Gray Road between 116th and 106th Streets. 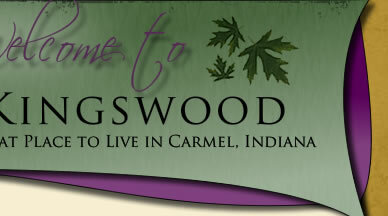 First developed in 1988, Kingswood was one of the first subdivision developments of its kind in Carmel. The average Kingswood home is approximately 3,000 sq. ft. and restricted to brick and wood construction. Lots have many mature trees and landscaping while sizes average approximately 14,000 sq. ft., providing adequate size while requireing minimal maintenance. In order to encourage the feeling of spaciousness and to improve the appearance of properties to neighbors, restrictions are placed on fences and owners are encouraged to limit the use of oversized play equipment. Kingswood does not have any "common" areas belonging to the Neighborhood. All land is in the name of individual lot owners. All streets, except driveways and limited common area streets, have been dedicated to the public and are maintained by the City of Carmel. Sidewalks are the responsibility of the homeowner. Well known for its excellent school system, the Carmel public schools for Kingswood are Forest Dale Elementary, Clay Middle School and Carmel High School. See Links for information about Carmel.